if this graph is anywhere close to accurate? That projection of electric generating capacity additions does not get us to stated emissions goals (e.g., 80% or 90% of 2005 levels by 2050.) We can easily observe that out-year EIA projections probably are not very accurate and that’s a fair point. I doubt, for instance, that this graph takes the EPA’s recent proposed rule into account. The next 5-10 years is probably close to what will happen, however – close enough that any difference will not significantly impact say 2030 or 2040 emissions. Note the vast difference between natural gas/oil additions for any single year between 2000-2005 and total renewables during any other year. The only year that comes close to the same size for renewables will be 2015, but that still only amounts to 1/3 to 1/2 the natural gas additions ten years ago. In order to achieve stated emissions goals, renewable additions will have to double every year between now and 2040. That’s because new additions have to replace the oldest coal plants first, followed by oldest natural gas plants, and also meet increasing future demand, and generate enough energy during peak production periods to exceed peak consumption periods (not the same times of day). Additionally, if we want to keep global mean annual temperature increases <2C, the projected natural gas additions have to tail off to zero (not stay constant) because they still emit GHGs. And if all of that weren’t challenging enough, we must remove carbon from the atmosphere that is due to historical combustion and leakage. 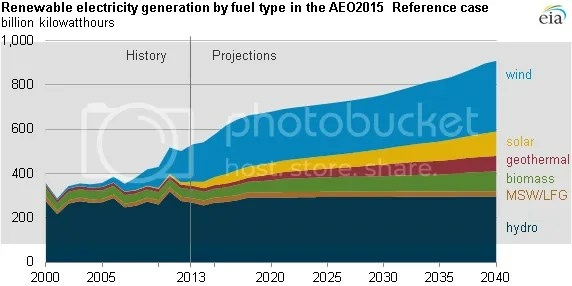 But the basic story of this graph remains: this projection will not enable us to achieve stated emission reduction goals. This graph is therefore useful in helping us understand what policies are working and what needs to be done in order to approach our emission goal. For instance, renewables appear to enter a period of no growth in the 2020s. That is probably unrealistic, but what policies should we consider to boost their deployment above 2005-2010 levels during the 2020s and on into the 2030s and beyond? How about finance policies for starters? How about long-term federal and state guarantees? If we enact the EPA’s proposed power plant rule in most any way close to how it is currently structured, the 2020s and 2030s will likely look very different from this. That rule could be a good start toward meeting future goals (just not 90% reduction by 2050 or <2C warming; more like 30% reduction by 2050). Categories: energy, global warming, policy | Tags: climate policy, CO2 emissions, EIA, electric generating capacity, energy policy, energy portfolio, GHG emissions, natural gas, renewables, solar, wind | Permalink.